Here are some camera advertisements that I scanned from the 1966 Photography Annual, published by Popular Photography (click on the thumbnails to enlarge). It's interesting to see that most of the companies in the ads are still around, but a few have disappeared or been bought out. Konica and Minolta merged in 2003, and Sony bought their photography business 2006. Dacora stopped producing cameras around 1972. It's also interesting to look at the features and marketing strategies of the different manufacturers - it's not that much different from today. Some are aimed at the professional and advanced amateur who want as much control and flexibility as possible, while others are aimed at the more casual user who wants to get great images without getting bogged down with too many accessories and features. Some of the ads were directed at the more technical-mided (Nikon especially), while others emphasized their reputation (Hassleblad, Rollei and Leica), quality and value (Konica and Minolta), and simplicity (Dacora and Konica). The only one that showed a photo taken by their camera was Asahi Pentax, which highlighted the creative possibilities of their camera. In 1966, 35 mm SLR cameras were becoming very popular, and the introduction of built-in light meters (sometimes called electric eyes) was being heavily promoted in the ads. This is the only colour camera ad, although colour photography was becoming increasing popular in the 1960's. The photo in this ad was the grand prize winner of the Asahi Pentax International Photo Contest. It's a pretty amazing shot using an 18mm fish-eye lens. I hadn't heard of Dacora until I saw this ad. It was a German camera company that specialized in inexpensive but high quality cameras. This model used Agfa's Rapid 35 mm cartridges, making them easier to load and did not require rewinding after exposure. Hasselblad is positioning themselves as the "best camera in the world" in this ad. It's hard to argue against that - they are still highly regarded today! I'd love to own one. Konica advertised 5 different cameras including a the Konica Auto-S2 rangefinder, the Konica FM professional 35 mm SLR and similar FP (without an electric eye), the simple to use Konica EEmatic Deluxe, and the Konica Eye - automatic and lightweight. They also emphasize quality at an economic price. Leica's ad is very simple and just states that this 35 mm SLR camera is a Leica. Leica was the top of the line 35 mm rangefinder camera, but SLRs had been recently introduced, and were becoming very popular with photographers. In response, Leica introduced their SLR, but it didn't do so well, mainly due to its high price and limited range of features and accessories compared to Konica, Minolta, Asahi Pentax, Canon and Nikon. The Minolta advertisement emphasizes their technical leadership (the Minolta SR-7 was the first camera with a built-in light meter), high quality and dependability. The Nikon Nikkormat FT was positioned as a high quality camera for the 35 mm enthusiast, at a price of $331.50 ($2277 in 2011 dollars) for the camera and 50 mm f/1.4 lens. Nikon was the only company that published their prices. This ad is very technical in nature and describes the details of the new Photomic T meter system. The price of the camera with a 50 mm f/1.4 lens was $433, which is quite expensive. Adjusting for inflation, it is equivalent to almost $3,000 in 2011. The Rollei ad says that it is the best camera for the best results - used by press photographers and prize-winning amateur photographers. It suggests that you will be like the successful photographers if you use a Rollei. Rollei has an impressive history and was using its reputation to market itself to serious photographers. The magazine also has some very inspirational photography, but I'll save that for another post! I have been exploring photographic creativity using old “vintage” cameras. Although digital cameras offer a vast array of powerful features, old cameras and lenses often create images that I would not have thought about doing digitally. Of course, most effects can be duplicated in Photoshop, but it's more fun and spontaneous to use older cameras directly. 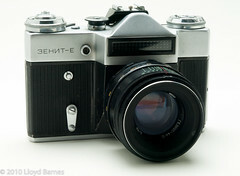 Combined with different types of film and processing, old cameras are a great avenue leading to creative image making. Lomography, for example, emphasizes the use of cheap analogue cameras and different types of film. Tiffany May, a very creative photographer who knows that I like to play around with old cameras, lent me her Minolta Maxxum 7xi (also known as the Dynax 7xi). Released in 1991, it was an advanced 35mm SLR camera, possessing many innovative features. One of the coolest things about it are the expansion cards. They're intended to make the camera easy to use - just load the card and set the camera to P (program). I guess in 1991 it was not feasible to build all of the programs into the camera like modern digital cameras. The cards resemble SD cards, but would have much lower capacity! Fantasy - changes focus during the exposure. Here's an example of the effects. Highlight/Shadow (H/S) - automatically compensates for bright or dark scenes. I addition to the camera, Tiffany had a large selection of Cokin A series filters with holders that fit the Minolta lenses. They look like a lot of fun to experiment with (but that will be the topic of another post)! I did try out the Diffractor Univers 041 filter, which gave a cool rainbow colour effect. I definitely want to try that filter out some more. The interesting thing about the Maxxum 7xi camera is that it's quite sophisticated, with many features that are not always available in DSLRs today, but simple to use with the expansion cards. In 1991, a decade before digital photography took off, Minolta was used computerization to help photographers get the most out of their camera without having to be an expert photographer. I'm looking forward to getting more creative with the Maxxum 7xi and the expansion cards! This is a pretty cool camera, made during Soviet-era Russia in the late sixties. The Zenit-E was produced by the Krasnogorsk Mechanical Factory (KMZ - Krasnogorski Mechanicheskii Zavod) near Moscow starting in 1967. It is a fully manual SLR with a selenium light meter above the lens. The available shutter speeds range from 1/30 to 1/500 s, with bulb setting and cable release for long exposures. The flash sync speed is 1/30s. It is rugged and reliable. It was a popular camera because of its low price. The lens shown with this camera is Helios-44-2 42mm screw mount 58mm f/2.0 lens. The camera remains popular today and gets great reviews. Although film photography is not as popular today since digital has taken over, there are many fans, new and old, who like this camera! I haven't tried it out yet but will post photos when I get the chance. Click here to check out more images of vintage cameras in my growing collection on Flickr! The Minolta Maxxum STsi (also known as the Dynax 500 SI Super in Europe and the Alpha Sweet in Japan) is the most modern 35 mm SLR that I own. It has all the automatic features that you would get in a modern entry level DSLR but of course it is a film camera. It has an automatic pop-up flash, price TTL metering, ambulance both spot and average, autofocus, a variety of exposure programs and a panorama mode. The Minolta camera company merged with Konica in 2003, then sold their photography business to Sony in 2006. Sony took over and further developed the camera system as the Sony Alpha system. 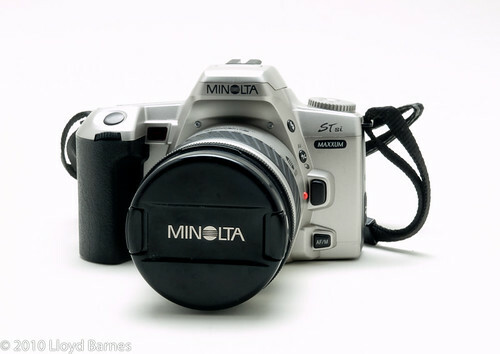 The Minolta cameras use a proprietary hot shoe (the same type as the Sony Alphas). I use a Pocket Wizard to trigger an external flash unit, so I needed to buy a hot shoe adapter. They are available in most camera stores or online. This camera is great to use, and being a modern camera, it feels a lot like using a DSLR. I occasionally look for the LCD screen, forgetting it is a film camera! The autofocus is fast and sharp. It has an autowinder so the next shot is ready to go very quickly. I use the camera in the studio with a light meter and external strobes, on manual exposure mode, and it has worked very well. Here are some studio shots that I took with this camera using Kodak Ektar 100 negative film. Overall this is an excellent camera for people who want to use a 35mm SLR but also want the modern features of a DSLR. It is also compact and lightweight making it easy to carry around. Here are some more images of this camera, as well as the 70-210 mm f/4.5-5.6 zoom lens and camera bag. The PDF version of the user manual is available online too!